Nobody ever wants to see water dripping from a ceiling or a water stain in their home and there’s certainly no good time for it. Unfortunately, with the harsh New England winters and summer storms upon us, some of us inevitably will confront a leak. If that is you, it can be pretty stressful and you might not know where to start. For this reason, we’ve compiled a list of 4 common roof leak causes to help you better understand potential issues with your roof. While it may seem too simple, your roof wears down with age, as does anything else. Throughout the lifetime of your roof, it can be exposed to a number of environmental factors that will compromise its integrity and cause a leak somewhere in your home. Your roof has many variables to contend with, sun, snow, ice, rain, and extreme temperature differences. Typically for an asphalt shingle roof, which is the most common residential roof system on the market, if it is 20 years old or more, odds are it is time for you to consider your options for a new roof. “Flashing” is the material used to seal any protrusion in your roof where something sticks out from it such as a chimney, vent or skylight. These require flashing to seal them watertight to the surface of the roof, to prevent any possible exposure to moisture. Over time and changing seasons, the flashing can lose its seal and let water into your home. Oftentimes, the areas can be re-flashed and the leak will stop. Sometimes, for example, the pipe boot or skylight may just be old and will need to be changed out and the area flashed before or while the new item is installed. Once the flashing has been compromised it is safe to say that water will inevitably find its way into your home. Typically, these types of repairs can be done quickly and at a minimal cost. If not fixed, the leak will continue to find its way into your home and create interior damage, which in turn, can be costly. Your shingles are the defensive barrier between the weather and the roof of your home. Therefore, any damage to them can potentially result in water leaking in through them. Over time and experiencing various environmental factors, your shingles can be loosened, cracked, or even begin to curl upward, causing points of exposure in your roof. Most times new shingles can be installed in the immediate area of the leak at a minimal cost to the homeowner. #4- It’s Not Your Roof! While leaks in your ceilings or attic can be easily caused by a roof leak, there may be a different explanation, including clogged gutters, plumbing leaks, a condensation issue, or the mortar between the bricks of your chimney may be eroding – all of which cause water damage. If you have a chimney and the leak is coming in from around it, chances are it is a flashing issue or a chimney issue which may require a mason. 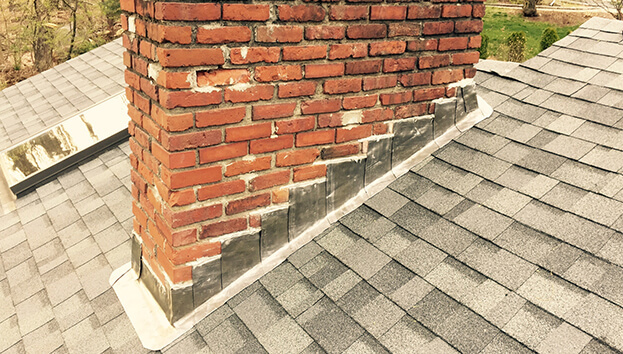 Most people do not realize their chimneys need to be maintained regularly as a common brick is similar to that of a sponge, absorbing water and wicking moisture to the chimney interior. If your chimney does not have a chimney cap, it may be something that you may want to consider as it acts like an umbrella when it rains and they are an inexpensive preventative measure that can be taken to keep your home dry. If the leak is coming from around a vent and it is not the vent or the flashing, it may have something to do with the plumbing and a plumber should be called in to investigate. In terms of condensation, if your attic space is not properly insulated or ventilated, it can cause condensation to occur. Many people mistake condensation as a leak. By properly ventilating and insulating your attic space, you can help eliminate the chances of condensation occurring. Considering all of these potential roof leak causes, it is important to be as informed as possible and to consider all of your options. If you are hesitant or unsure of the cause of your leak, it is always advised to speak with an experienced professional. Call On Top Roofing today and we’re happy to help make this stressful situation a smooth and easy one!